This week (August 20th – 28th) marks National Heritage Week in Ireland. It is a multifaceted event coordinated by The Heritage Council that aims to aid awareness and education about our heritage, and thereby encouraging its conservation and preservation. As part of Heritage Week 2016 there are daily posts to the Disused School Houses Blog, and this is the seventh post in the series. 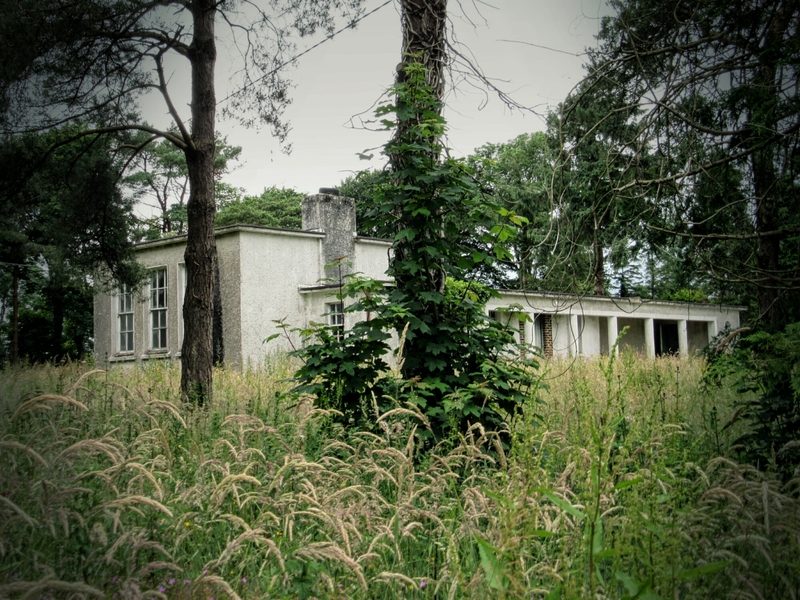 This post takes a look at the one-roomed school house in rural Ireland, and it’s significance as a symbol of the development of a more progressive education system for all. A few miles north of Dunmanway in West Cork, is the little rural hamlet of Cool Mountain. Through the 1970s, this area was settled by a commune of mostly English folk, who felt Poll Tax and Thatcherism wasn’t for them, and so they made the mountain sides their home. In summer, this is a particularly lush and green place; wooded and mountainous, isolated and peaceful. The land is rough but resourceful, and it’s easy to see what attracted the settlers to area in the 1970s. The landscape of Cool Mountain seems to have retained an authentic rural feel; the roads are poor, the houses sparse, and there is a sense of timelessness about the place. Here, located just off a small local road, and partially hidden by trees, is the disused Cool Mountain National School; a diminutive one-roomed corregated iron structure that is among the more unusual school houses I’ve seen to date. Built sometime in the 1950s, it replaced an earlier local school house, though the galvanise building only contined to operate as a school until 1969 before closing. It is a quintessential yet unconventional one-roomed school; unconventional in it’s design and the materials used in it’s construction, though quintessential in it’s former role as the hub of education in a rural location. Rural one-roomed school houses in particular, tell the story of making education available to all who wished to avail of it through the 19th century. These buildings consisted of one classroom where a single teacher taught academic basics to several grades of primary school-aged boys and girls. Altough there were architecturally elaborate school buildings (most often patronised by a local land owner), they more frequently comprised functional structures, usually lacking architectural ornamentation, and built to serve a small local population. After the National Schools Act of 1831, the need for, and mechanisms to build new school houses created a demand for new school buildings in rural areas, and these simple structures helped to meet that demand. Many were built by local communities using local materials, but to a number of standard designs supplied by the Office of Public Works; hence there are schools of identical form scattered all across Ireland. This in itself tells the story of standardising education, and providing for the educational needs of the general public; a huge, and progressive leap forward at the time. Better education was both a goal and a tool in the comprehensive modernising projects of the 19th century. The schoolhouse held notable significance as an institution for education, and represented a shift towards better education and schooling. In reality, it cannot be understated how significant these buildings were in bringing learning to the masses. They were at the heart of the community and remain symbolic of a more progressive ethos that stemmed from the 1831 Act. Rural in character, for a young teacher, these were often outposts of education. At times, a school might only serve a handful of families in locality. Nonetheless, schools that children could walk to were required, and therefore many small schools with comparatively small catchment areas were constructed. Prior to this, many rural areas lacked any kind of formal educational infrastructure, and these buildings represented the first steps in making a formal education available to all. Today, you will generally find these empty buildings in the most sparsely populated of areas. Often hidden on mountain sides, or crumbling behind ivy, they remain as testament to times past, and symbols of changing educational needs. One room school houses are no longer constructed, and the latest one-roomed school that I’ve visited is Ballymacelligott National School in until Co. Kerry, probably built some time in the 1950s. Until the 1950s, small multi-grade schools were established throughout Ireland as part of the education infrastructure. However, During the period 1966-73, the number of one and two teacher schools was reduced by c.1,100. Did this decision to close so many rural schools have a positive or negative impact on the rural Irish landscape? If you or someone you know attended these national schools, please do get in touch and share any stories, anecdotes, photographs, or any other memories you may have. Just planning my next excursion so that area looks very promising!